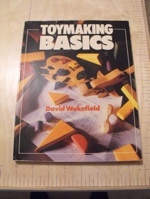 This book is a how-to on making toys. From tool selection and set up, to working with patterns and toy parts, and it includes a few primitive patterns. Book Publisher: Sterling Publishing Co. Condition of this recycled book: Good, cover is a bit worn on corners (priced as marked), we have a few copies of this book available.